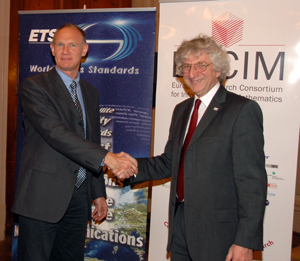 ERCIM and ETSI, the European Telecommunications Standards Institute, have co-signed a landmark Memorandum of Understanding (MoU) to launch their future close collaboration. The organisations' commitment to their future collaboration was initiated by an inaugural high level seminar at ETSI headquarters on 29 November 2007, the first in a series of envisaged joint events. The seminar took place in Sophia Antipolis, France, where both ERCIM and ETSI have their operations. The seminar included presentations from the European Commission DG Information Society & Media and the Joint Research Council (JRC) as well as from top level representatives from Alcatel-Lucent, the Austrian Academy of Science, BT, Ericsson, Fraunhofer-Gesellschaft, University College Dublin and the World Wide Web Consortium. According to ETSI Director-General, Walter Weigel: "ICT markets are shaped by [ETSI] Standards which enable the widespread use of new technologies developed after extensive research activities led by organisations such as ERCIM and so cooperation between our two communities can only be beneficial. This is an exciting development for all innovation food chain stakeholders and our corridors are already buzzing with ideas for the future". ERCIM President, Keith Jeffery said: "The greatest satisfaction for researchers is to see their ideas carried forward to products and services that are used widely. There are many examples where ERCIM researchers have achieved this. However, this cooperation with ETSI allows us to accelerate the innovation chain by overlapping research, testing, standardisation and exploitation, thus creating a leading position for the ICT industry within Europe, the results of which will then spread -like the World Wide Web- to the rest of the world." "The infinity Initiative" envisages a number of joint events including advanced workshops, seminars and meetings. It aims to strengthen the links between standardisation and research and has the support of the European Commission. The name "The infinity Initiative" was chosen in allusion to the enduring and futuristic nature of research.